You can learn more about your eyes here in a single day, than most people find in their lifetimes. Want to know why you first needed glasses? Science, definite, clear answers? We have those here for you, including studies and PhD’s explaining what’s going on. Understanding the problem is the first step to fixing it. Since it’s not a simple subject, we broke it out into the short (and simple) version, and the long and detailed one. Try the short one first, get into the long one if we made you curious. At it’s simplest, blurry distance vision starts out as a focusing muscle spasm. Your eye focuses using a muscle, which changes shape of a lens in your eye. Too much close-up vision, the muscle is tense, fails to relax, you get “stuck” in close-up vision mode. This is often referred to as pseudo myopia or NITM (near-induced transient myopia). Relaxed vs. tense focusing muscle. 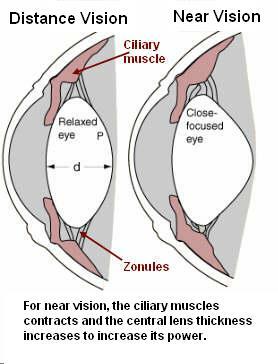 The ciliary muscle focuses the lens in the front of your eye. Tense muscle for close-up, relaxed muscle for distance. The muscle isn’t designed for hours and hours of close-up. Eventually it spasms and fails to fully relax – that’s why you can’t see clearly at a distance (pseudo myopia). Left we have again the relaxed muscle, and on the right we have the tense one. You have a muscle designed to be relaxed for the majority of the focusing need, and tense for short intervals. We are supposed to look at medium and far distances a whole lot more than up-close! Unfortunately modern life reversed the use of our eye. Lots of close-up, very little distance. That is the first stage of myopia. This accounts for less than two diopters of correction. Incidentally your first pair of glasses were almost certainly in the 1-2 diopter range, and no higher. The focusing muscle spasm just creates a small degree of myopia. But once you wear glasses, your eyes get worse. This is often referred to as lens-induced myopia. Top, eyeball without a lens, bottom eyeball with a lens in front of it. The lens moves the focal point of the light further back inside your eye. When the focusing muscle has spasmed, fails to relax, the lens inside your eye doesn’t adjust enough for distance vision. There you have it. Your eye is “stuck” in close-up vision mode. Instead of dealing with that actual issue (just a muscle spasm), the lens instead forces the focal point back further to give you back distance vision. This is problematic because it creates an artificial stimulus inside your eye. It says, “the focal plane has changed”. Your eye is a dynamic system, seeking balance from external input (your sight). More detail on that in a moment – for here though, just realize that your eye adjusts in length based on the focal plane stimulus. Getting complicated? The short version: a lens in front of your eye moves the light back further inside your eyeball. 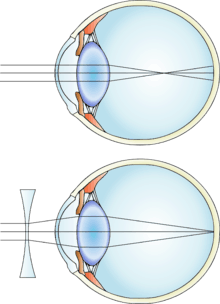 This causes the eyeball to gradually elongate to compensate for this change in focal plane. Elongated eyeball means that the light will never focus on the retina, without the use of corrective lenses to move the light back far enough. This is the thing that creates your myopia over -2.00. 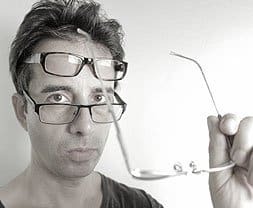 The increasing myopia you experience, more and more prescriptions as the years go on, are caused by the lenses you wear (and the ongoing strain from too much close-up, to some degree). Lens-induced myopia is progressive (ie. it gets worse), because of the dynamic nature of the eye. To fully understand the subject, a bit of reading is helpful. To fully get into the details, a bit of reference to research studies and human biology is necessary. Thousands of these studies exist in medical science, so we don’t need to reinvent the wheel here. 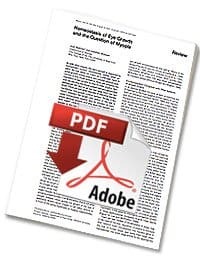 If you wonder what is true about vision rehab and what is a scam, reading the PDF link below is going to be most helpful. It gets really into the heart of the discussion, which also makes it a bit of a long and challenging read. It’s entirely worth it though, if you are curious about your eyes! Take a look here at an interesting summary of the eye, state of science affairs, and review of myopia. Now, after you read all of that, realize that it isn’t the whole entire story. There is conjecture, there are studies for and against various aspects. But it is still one of the most comprehensive summaries on the topic to date. We here are a bit biased. We believe in strain management, positive stimulus (dynamic eye, remember), and habits that encourage healthy eyesight. Some research substantiates this, though it is still a hotly debated subject. Realize that all the Internet quick fix unicorn farming eye vitamins won’t do a thing for you (remember, causation is key). Realize that eye exercises may provide a quick boost but aren’t a long term solution (again, not addressing the cause of your myopia). If you want to get out of myopia, you’ll have to look at this as a project. Like starting a gym habit or learning a new skill. Start by reading the how-to guides in the blog. Find the free 7 day course at the end of the guides. Sign up (it’s free, no catch), take that quick 7 day course. And then keep reading. Read through the hundreds of results and progress reports for motivation and ideas for your own journey. And from there start seeing those 20/20 gains happening for you!